Why we all need to consider green smoothie to be included in our diet? As the world becomes more complicated, people cannot deny that their life is now full of activities. It is not a new thing that nowadays stresses level increased, and a pollution also becomes intolerable while people keep busy and tend to forget to maintain their body with proper nutrition and anti-oxidant to balance all between the toxic and stress level that we get from our environment. With that background, the best way to help us keep maintaining our nutrition intake is by taking a green smoothie. Why the green smoothie? 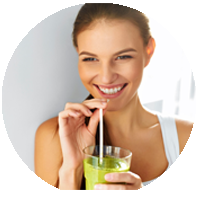 Yes, based on the study mentioned in this article, green smoothie known as the most drink that contains high antioxidants and phytonutrients which can help you to increase your antibody plus increase your digestive system and many more. The idea to make your green smoothie is to let you decide the ingredients that you want to put into your smoothie maker or something that we use to call a blender. Besides that simple thing when making a green smoothie, we need to keep in mind, and it is a "green" smoothie means the basic ingredients should be green vegetables. Also, you can add other fruits like green apple, pineapple, kiwi and sometimes you can put milk into it. When choosing green vegetables, the first thing that I recommend is to use organic green vegetables, or if you cannot find it around, at least you need to find non-pesticide vegetables. What is the point if while we want to remove all toxins in our body but we still consume the pesticide that also can be dangerous for your body. Kale is the best ingredients so far I can be recommended, it known as the mother of green vegetables, it contains high fibers and high antioxidant levels that you may not find it in other kinds of vegetables. Besides that, it also contains a bunch of vitamin A that is good for your body. The other green vegetables that usually included in green smoothies are spinach, beet greens, chard, and celery. Since you are using green leafy vegetables, then you will get a bitter taste from it, that is why you need another ingredient that can help to remove the bitter taste. You can use ginger, banana, apple, or lemon. After all that you need is a blender, put all ingredients into your blender and schedule this activity as your daily basis routine, and start feeling the benefits. For additional toping you can use chia seeds or flaxseed, you can sprinkle it on the top of your smoothie or sometimes include it as main ingredients along with the other ingredients and blend it together. The more you use chia seeds the more you understand how to use chia seeds and the more variation you can do with the chia seeds.